New Harbinger Publications, 9781608820313, 232pp. You've heard the expression, "It's the little things that count." It's more than a simple platitude. Research has shown that integrating little daily practices into your life can actually change the way your brain works. Moment to moment, whatever you're aware of--sounds, sensations, thoughts, or your most heartfelt longings--is based on underlying neural activities. This book offers simple brain training practices you can do every day to protect against stress, lift your mood, and find greater emotional resilience. 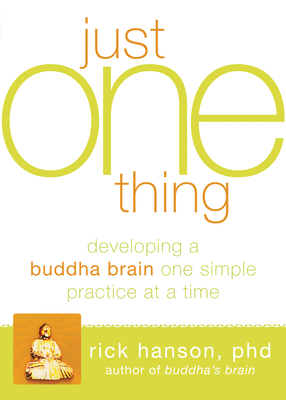 Rick Hanson, PhD, is a psychologist and author of Buddha's Brain, which has been published in twenty languages. He is founder of the Wellspring Institute for Neuroscience and Contemplative Wisdom and an Affiliate of the Greater Good Science Center at the University of California, Berkeley. He has been invited to lecture at Oxford, Stanford, and Harvard, and teaches in meditation centers worldwide. He lives with his family in the greater San Francisco Bay Area. For many resources freely offered, visit www.rickhanson.net.